KONFORT 744 – R744 (CO2) refrigerant - TEXA UK Ltd.
the new CO2 air conditioning systems. TEXA is universally recognised as one of the undisputed leaders in equipment for garages and vehicle repair shops. TEXA’s product range includes diagnostic tools, exhaust gas analysers and air conditioning system servicing and recharging stations. In particular, TEXA is recommended by many of the most prestigious European vehicle manufacturers. TEXA’s strengths reside in high-tech production processes, robustness and quality finish. The new station therefore conforms to the strictest industry standards governing air conditioning maintenance and recharge systems for the new R744 (CO2) refrigerant. These new systems are intended to minimise pollution and to reduce the risk of fire in the event of leaks, and are radically different in design from previous generations of recharge station that used R134a and R1234yf refrigerants. In particular, because the new systems are designed to function at high pressures, dedicated recharge stations are needed to work with them. PLEASE CONTACT ME FOR A DEMONSTRATION! 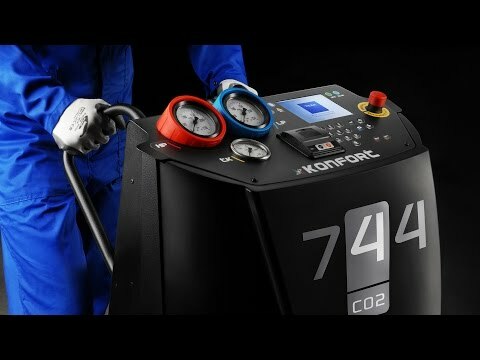 The KONFORT 744 implements a range of innovative solutions and differs from the other models in the KONFORT Series for the fact that it is designed and made specifically for use with the latest A/C systems that use R744 (CO2) as refrigerant. Despite its advanced design, however, the KONFORT 744 is just as easy to operate as its more conventional counterparts dedicated to R134a and R1234yf refrigerants. The station is fully automatic and able to complete the recharge cycle without any assistance from the operator. It also achieves the highest possible levels of precision. In fact, the quality of its components and the accuracy of its design permit recharging to be completed to a maximum tolerance of only 10 grams (2 grams for oil). Special attention has also been paid to the system for releasing CO2 into the atmosphere. Release takes place in a controlled manner to ensure the safety of the operator and of the system itself. The KONFORT 744 also incorporates an accurate system for measuring the concentration of CO2 in the surrounding air, and suspends charging if this approaches a dangerous level. The operating software conforms to the strictest standards for precision and accuracy. Thanks to an extensive network of sensors, TEXA software can identify refrigerant types and perform recharging operations with unprecedented precision. Automatic procedures help operators to service the most sophisticated systems, like those found on the latest hybrid vehicles, for example. Removable memory (SD cards) can be used with all models to communicate with a Windows PC, to check and certify maintenance operations, and to upgrade software when necessary. Standard tanks are not sealed and therefore inevitably contain a certain amount of air. The water molecules contained in this air bond with the oil and contaminate it. TEXA’s solution to this problem is to use special, patented tanks that are sealed to prevent contamination of the oil by air and humidity. TEXA’s special tanks can be recharged again and again, thanks to a special device that eliminates all the remaining air before refilling. The 744 automatically checks for leaks in the vehicle’s air conditioning circuit before it starts the recharge cycle. Leaks can also be traced using a special leakage detection system based on forming gas, a mix of 95% nitrogen and 5% hydrogen. An external sniffer can be used to locate leaks easily. The recharge station incorporates a thermal printer to provide detailed reports on all the operations performed. Customers purchasing a KONFORT recharge station enjoy all the benefits of advanced technology and can also rely on TEXA as a professional and dependable partner. TEXA boasts an extremely efficient, nationwide After Sales Service. Our Service Partners are highly qualified and continuously updated in the use of TEXA tools and the latest technical assistance methods.